Dr. Algirdas Kanauka’s noteworthy literary masterpiece, “Raven’s Flight to Freedom,” vividly paints his story of survival, adventures, experiences, insights, escape, and evasion through the most infamous time of the 20th century, WWII. The book serves as a soulful expression to those who struggled during the regime of harsh communism that some people are oblivious about. 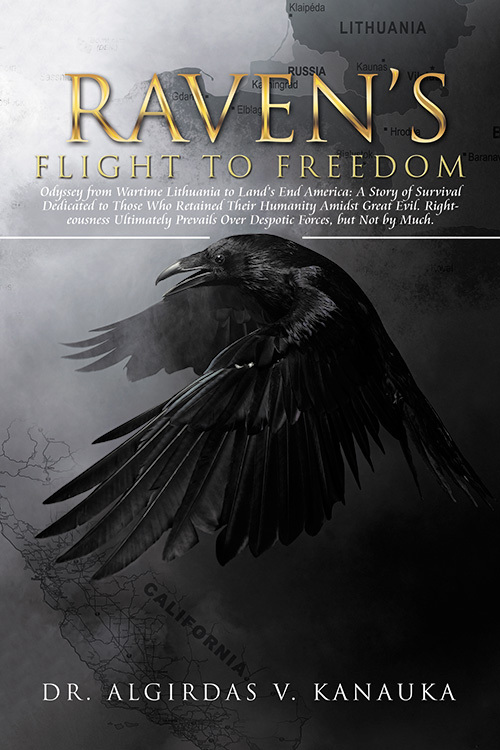 “Raven’s Flight to Freedom” has received a lot of 5-star reviews due to its powerful content and the way it is constructed. One review stated it [the book] covers a complex time in our history in all ways possible to be seen. The stories are amazing! This author has a very soulful expression in his writing along with his wit and an unbelievable memory, delivers not only educational value but entertainment as well. Get into the details of Dr. Algirdas Kanauka’s struggles adversities and know how a raven soars high into the skies of freedom by grabbing a copy now. Algirdas Vincas Kanauka was born in Kaunas, Lithuania 1931 into a family of a prominent University Professor & Surgeon, Vincas Kanauka. He went to Germany before the end of WWII to avoid having to live under Soviet communism again and survived the war through good luck and good will of some people. After the war he lived in a Displaced Person camp in Kempten, Germany for four years, then immigrated to the USA in 1949 attending State College in Mississippi and then transferred to the Citadel Military College of South Carolina from which he graduated (1954) with a BS Degree in Electrical Engineering and commissioned as a Second Lieutenant in the USAF. Algirdas then became a Navigator & Electronic Warfare Officer (sobriquet - RAVEN) in Strategic Air Commands B-52, B-58, and RC-135 Units; was also assigned to Europe Command as Development Engineer in West Germany. Retiring from USAF in 1976 and with the rank of Major, Algirdas went to work as a member of the technical staff, project engineer and program manager in the aerospace industry: Hughes Helicopter Division of Summa Corporation, Resdel Engineering, Inc., and Aerospace Corporation in Los Angeles area. After Lithuania regained independence in 1990, he went back to Lithuania to be a Consultant to the General Staff and Lecturer at the Lithuanian Military Academy, retiring in 2015 in Rancho Palos Verdes California. Author’s academic degrees: BS in Electrical Engineering from the Citadel, Master In Business Administration from the University of Dayton, Ohio, Master of Science in Systems Management and a Doctorate in Public Administration from the University of Southern California (USC). Author was married to Lily Marroquin (now deceased), and had three children - Fernando, Irina, Anna Maria and one grandchild - Harrison Taylor. Authors Military Decorations include: Air Force Commendation Medal, Bronze Star, Meritorious Service Medal; and several foreign decorations: Lithuanian - for Merit, Austrian - Black Cross, Vietnamese - For Service in Vietnam War.